Many of us look back on the 70s as being a time of tackiness gone wild. Some of those now retro luxury options, though, really need to make a comeback in today's cars. Some of us remember the 1970s. At least, vaguely we might. Being a child of the 70s, I remember the times as being good. Cars were huge and roomy, the hair bands that ruined heavy metal hadn't started yet, and you could still look under the hood of the car with your dad and name the dozen or so parts visible on the engine with certainty. My how times have changed. Today, nobody rebuilds carburetors, driveway oil changes are unusual, and cars are tiny with a lot more electronics than steel. The land yacht whose safety relied on sheer size and mass has been replaced by air bags and collision sensors. Of course, some of these things are good. Cars today get more than double the mileage their 1970s counterparts did. But who can deny the sheer opulence of the 1977 Lincoln Continental Mark V with its affluent, efficiency-mocking 7mpg? Today, cars generally feature seating that is stiff and bucket-shaped. Sure, it's comfortable, but only just so. We pillow-top our mattresses, couches, and office chairs. Yet we leave our automobiles with what amounts to carved rocks for seating. Bring back the pillow top so we can snooze at long lights again! Called "opera" windows and lights, these were the little touches added to coupes and sedans to hint at their luxurious limousine-like interiors. It let the world know that you weren't driving just any standard Buick. Nope, it's the luxury model! Ya, they're aerodynamically unsound, but big hood ornaments were awesome. In fact, they were so cool that some after-market kits allowed you to make them removable (like the face-plate stereos of the 1990s) so that hoodlums wouldn't steal them to make necklaces. Some were so theft-proof, you could tie a tow strap to them and pull the car to the garage if you needed to. Remember when trim designations were more than just a letter or number? Today, it's the "5" or the "M" that says it's the "upfit" model. Back in the day, though, it was the "d'Elegance" (not just elegance, but French elegance, damn you) and the "Regency" (GM had a special flair for coming up with these titles). When you told your friends that you'd bought a new Cadillac, you could say it was the "Seville Elegante" to make sure they knew that you got the primo package for ultimate opulence. Remember when cars had wood (or at least faux wood) on them? Even the lamest of mobiles could be upgraded to bitchin-ness with a little plastified wood. Questionable automobile choices like the Ranchero looked less so when you added the faux wood treatment with its ultra-tacky borders. Of course, the ultimate in wood treatments were the station wagons of the day. 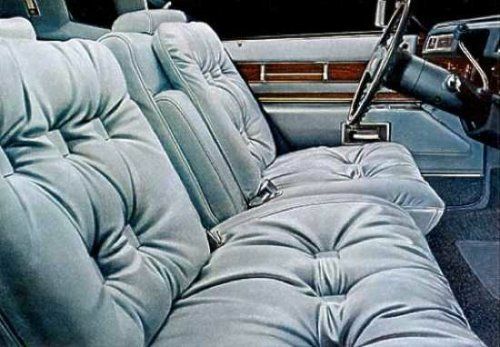 No family land yacht that seated 100 was complete without backward-facing seats and faux wood paneling and dash treatments. With a million horses under the hood, all that wood around the car, and a suspension that made the term "body roll" mean something akin to ocean going liners.. those were the heyday of family vacations on the road. Bring these features back, I say! Sure, the flecked paint and chromed plastic on the newest line of today's luxury cars might be great and all, but unless they throw on some faux wood paneling, add in pillow-top seats, put on some Opera lighting and windows, attach a big royal crest-appearing ornament on front, and call it the "d'Awesome Gucci Ninety-Eight", I'm not buying. My 69 Plymouth Fury III Had littel lights inside the ashtrays that were on evey flat surface it seemed. It seated 6 and slept 2. Sweet! My 1973 International Traveall didn't have any "luxury" items per se, but it sat 25 (literally) and slept half that many if you removed one of the benches. Yes, I took it camping a lot. Hood ornaments fell victim to European pedestrian standards - and seeing as most new cars are being built for a world audience we will probably never see them again. Good article. I could not agree more. My wife's 1990 Cadillac Fleetwood Brougham d'Elegance lacks all the geewhiz electronic gizmos of today. But the seats are luxurious, the engine sounds quiet and smooth at idle or full throttle even though it is only based on the Chevrolet small block V8, and the four speed auto shifts more unobtrusively than many modern five and six speed automatics. I can read the instruments in the dark or in brightest daylight, unlike my 2010 car. Bumps are absorbed quietly and unobtrusively. And the engine doesn't have to downshift at every little tap of the accelerator. It has been surprisingly low maintenance. Obviously the height of luxury. It has THREE NAMES. Today, it's called the Cadillac FM340i with the J level trim. Not nearly as classy. Ya, except... that weight you refer to for nearly all vehicles you mention (sans SUVs, which hardly existed in the 1970s) is thanks to government regulation (mostly adding safety features). Neither the Civic nor the Camaroare luxury cars. I will call you out on those Camaro numbers, though, which are wrong. The 2011 Camaro weighs 3,780 at the curb, only 500 pounds heavier than the 1970 model. The Cherokee wasn't introduced until 1984. Again, outside of the scope of this article. As for your statements about CAFE: more ranting on your part. I see little gain from CAFE forcing. Why do we need better fuel economy? Really? If emissions are the problem, then why aren't standards focused on those rather than on some ambiguous fuel economy numbers instead? Even if you buy into the anthropomorphic global warming story, your problem is still CO2 emissions, not fuel economy. The CAFE was enacted to reduce dependence on foreign oil, which is has not done. Like the EPA, CAFE has failed to deliver on its primary purpose. You should also be aware that this country was started in protest of taxes and our civil war was largely fought over taxation. I looked up the numbers on the Civic, just for grins. Your weights are right, but you miss a very important point: the original Civic was available only as a 2-door and as a SUBCOMPACT when introduced in the U.S. in 1973. Since that time, the Civic has changed markets and become a compact sedan in a more upscale fitting. Meaning it changed segments and therefore comparing 1970s weights to 2000s weights is apples to oranges. "People who want to buy massive cars should pay for the privilege in the form of increased and more broadly/evenly applied gas-guzzler taxes, and road-use taxes based on vehicle mass". We all pay taxes for the gas we use. We all pay the same tolls. Sounds pretty evenly applied to me. Why should additional taxes be used to punish someone for wanting to drive a larger vehicle over a smaller one? A 1949 Hudson we owned had two glove boxes. One for the driver and one on the other side of the front seating area. The largest Fords of the 70's had luxurious rides, were very quiet, and had optional huge V8 engines that rarely rose above the background noise. And they were quiet on deteriorated roads, thanks to separate body and frame construction. Unlike our new Mercedes V8 sedan, none of them ever had an oil cooler seal fail and dump engine oil on the road.